The Milford High School Athletic Booster Club is dedicated to promoting school spirit and community involvement for the school, celebrating the school’s achievements in athletics, arts, and the various clubs and service organizations, and raising funds to help support these extended school activities. The Athletic Booster Club is made up of parents of MHS students, MHS teachers and administrators, MHS Alumni, and Huron Valley community members. This is a non-profit organization, raising money through the sale of concessions, spirit wear and other fund raisers. Distribution of the funds is based on parent involvement for a team or group, giving points for volunteer time and paying out on a quarterly basis. Individuals may also apply for scholarships to participate in activities to further their talents. Milford High School sponsors a wide range of extracurricular activities, so challenge your student to get involved with a group, club, or team. 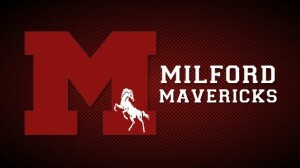 Click on the Milford Maverick logo below to visit the Milford Athletic Boosters Page.